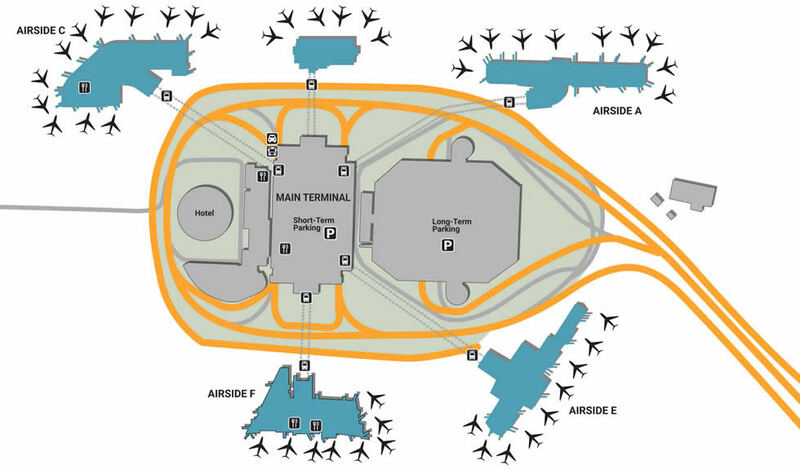 Finding transportation at the Tampa International Airport can be tricky but our terminal maps can help you get there better along with your email confirmation instructions for when you get off of the airplane. Looking out at Florida’s Gulf Coast, Tampa is a beautiful waterside metropolis that’s developed a splash of Cuban as well as Spanish influences. Enjoy your surroundings by making the most of every moment, including your time spent at Tampa International Airport. With upscale restaurants and helpful services, you’ll find every moment as efficient as it is enjoyable. With available parking for every gate, convenience is synonymous with Tampa International Airport’s parking division. Located at levels 4-9 above the Main Terminal, the short-term garage gives easy access, about as easy as the Long-Term garage, which is located on Level 5, offering immediate pedestrian access through a walkway. For an even lower daily charge, park at the Economy Garage, open 24 hours and offering complimentary shuttles every 10 minutes. Ask about becoming a SunPass member for extra benefits, giving yourself the biggest bang for your buck. Take advantage of Guest Service’s exemplary hospitality by visiting the Level 3 kiosk near the Main Terminal. Enjoy the latest installments added to the public arts program, admiring local as well as international works while you’re there. Tampa Airport is also famous for being incredibly eco-friendly, something that especially shines through with innovative bathrooms and electric car charging stations at Green Parking, located on Level 5 of the Short-Term Lot and Level 2 of the North Garage. A great way to spend unwanted time is to spend unwanted money. Get something worthwhile near Level 3, Gate 99’s Tampa!, an energetic gift shop that sells colorful beach tees and other fun merch that reflects the surf city’s unique style. If you’re more in the mood to sift through an upscale wardrobe selection, explore the Shoppes at Marriott, located near the Level 3 Airport Hotel entrance behind Tech on the Go. If you’re on Airside F and need a special gift that’s as triumphant as your return, check out the crystal jewelry options at Swarovski, located across from Gate 85. With awesome eats pick-me-up drinks, all the restaurants and coffeeshops in TPA are located on Level 3 of the Main Terminal, offering quick convenience in one location. Grab a familiar burger at Wendy’s located at the corner of the food court, or enjoy a filling Asian-Fusion lunch at P.F. Chang’s. If you’re traveling as a family, enjoy a wholesome sit-down lunch at Hard Rock Cafe or the quick and tasty fried chicken at the iconic Chik-fil-A.